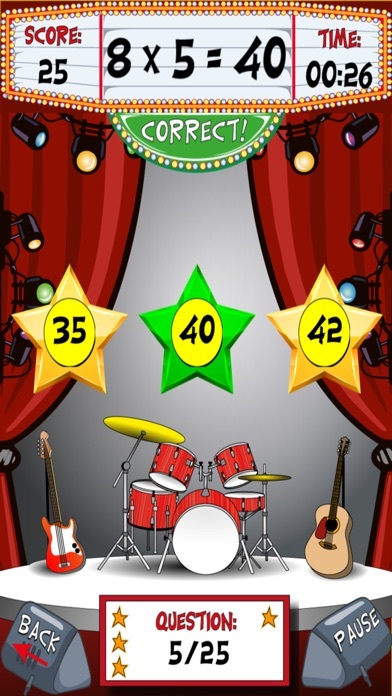 Maths Rock lets kids rock out while practicing their basic addition, subtraction, multiplication, and division skills. 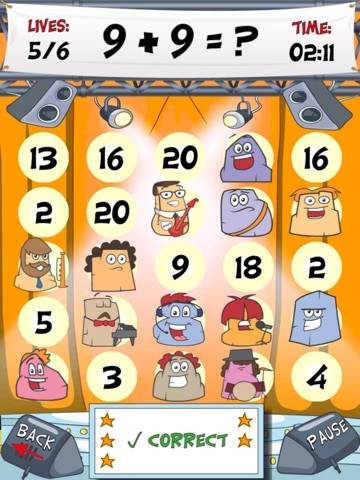 Kids can choose to practice these skills through a simple bingo game that has them solve problems to get five “Rocklies” in a row or choose to focus solely on their times tables through another simple, yet fun challenge activity. Although the activities are simple, the app offers a quality design and many different problems for kids to solve, making it a great option for kids who need to brush up on their skills. 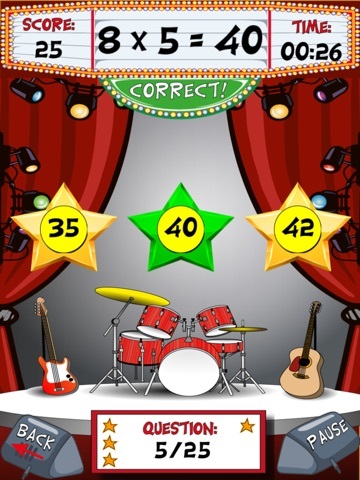 This app is a fairly simple math practice app, but it offers a lot of little touches that improve its quality. 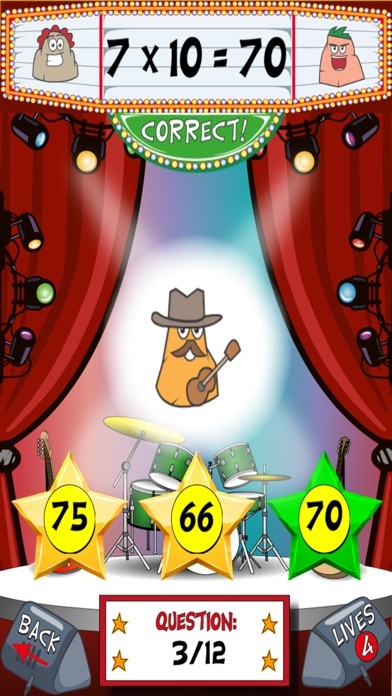 For example, kids will hear a fun rock song playing in the background and watch rock-and-roll loving rocks, called “Rocklies,” rock out on the screen. The app is also well-organized. 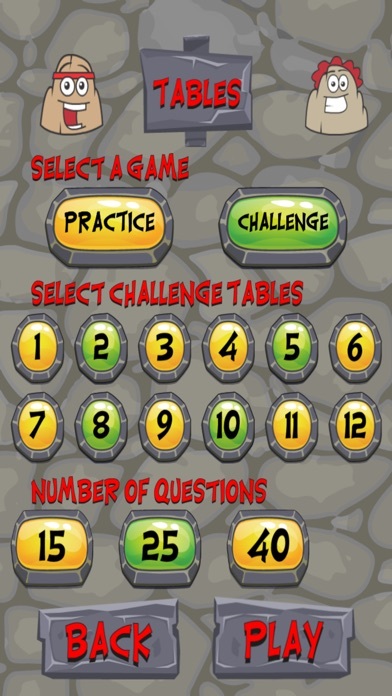 The main menu features three options: Bingo, Times Tables, and How to Play. Choosing either of the two games takes kids to a screen where they can select the specific skill they want to practice and the level (easy, med, hard). 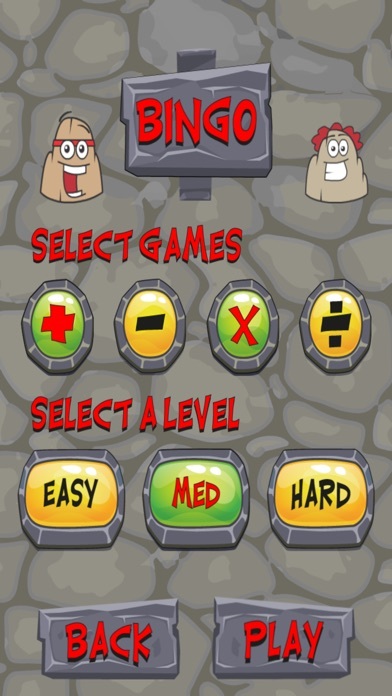 The games all feature a clear start button, along with a lives indicator and timer at the top of the screen. The only negative is that the problems and answers appear a bit slowly on the screen during the bingo game, so kids may try to answer them too quickly and end up accidentally getting an answer incorrect. Kids can practice their basic math skills through two different games. The first is a traditional bingo game that has kids solve simple math problems to place “Rocklies” on the board. To win, kids must place five “Rocklies” in a row. Kids can choose to play the game with addition, subtraction, multiplication, or division problems. They can also choose from the easy, medium, or hard level. The different levels introduce different ways of solving the problems. For example, instead of 2+2=, kids may have to solve ?+2=4. 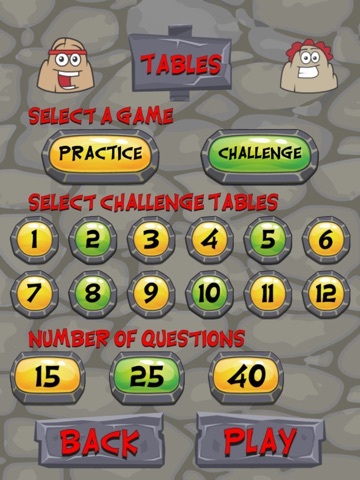 The same style of problems are found in the more difficult levels of the times tables game. 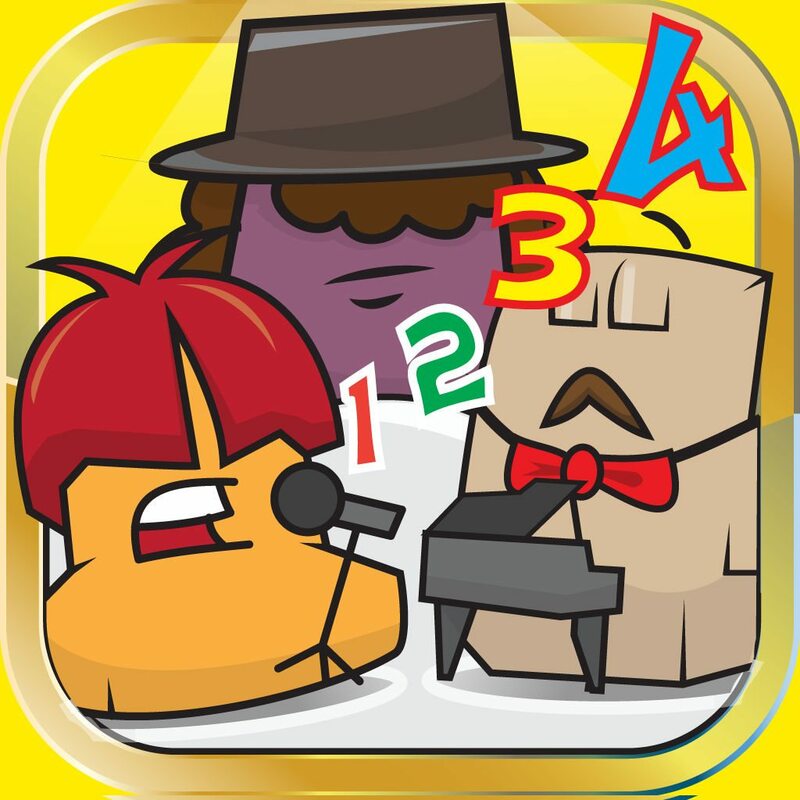 In this game kids can play either the practice or challenge mode. In the practice mode they can only choose to work on one number (1-12), but in the practice mode, they can include multiple numbers to help them get a handle on all of their basic times tables. When kids first open the app, they are greeted by peppy rock music, which fits right in the with the name of the app. As kids play the game, a series of “Rocklies” give them positive praise when they answer questions correctly. The bingo game is the most entertaining of the two activities. It is made more entertaining by the three levels of difficulty and the timer at the top of the screen. Even kids who get all of the answers correct may want to keep playing to try and improve their time. For the price, the app offers two different games. The first is a bingo game that allows kids to practice their addition, subtraction, multiplication, and division skills. The second is a times tables game that helps kids practice their times tables from 1-12 in two different ways. The large amount of content makes this app a decent value for parents and teachers who want to give kids another way to practice their basic math skills. The app does not contain any in-app purchases, more apps icons, or other content that has not been designed for children. It does have a “How to Play” section that gives a detailed overview of how to play the game that may be a bit lengthy for young children to read, but parents will understand it perfectly.